Tom and Dom from Loaf have been rightly annoyed with me for not having put the fabulous Loaf Community Bakery on the Birmingham Food Map yet. A source of great shame; when we conceived the map project my plan was to post one item per day until we were exhausted of all options. However, it was not to be, due to burn-out from non-blog projects. 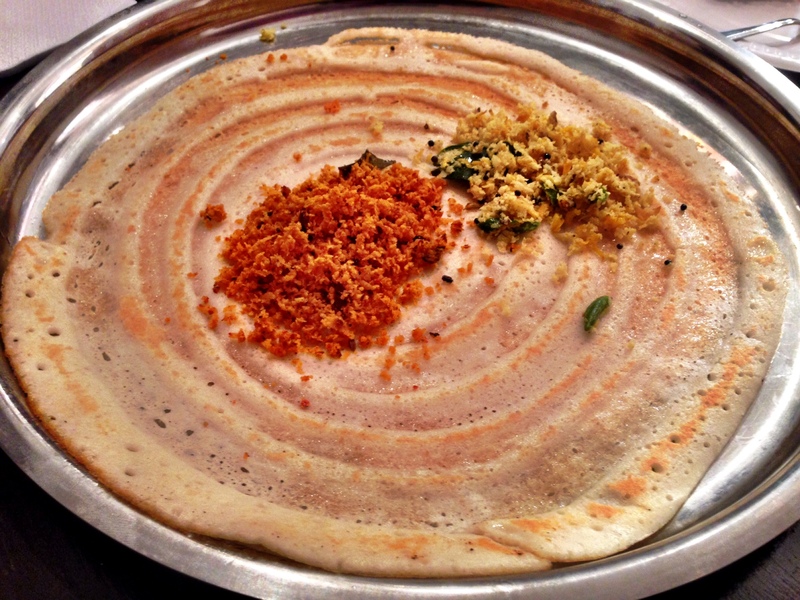 Yet, I don’t feel that bad, as I figure if you already read this blog, and are therefore an afficionado of the Birmingham food scene, you must know of Loaf already, which serves as a kind of beacon for those interested in food in the City. But anyway, sorry to Tom and Dom and pleased I can correct this wrong now! So what to say about Loaf Community Bakery – originally a ‘bread club’, a subscription-based bakery run from Tom’s house and domestic oven, he has since harnessed the support of his community to set up a fully-fledged bakery and cookery school in a shop front on Stirchley High Street. Tom has strong ideas about the power of projects such as his, not just to supply great food, but to help communities ‘save’ their local high streets from shuttering and the inexorable creep of the major supermarkets. The way I look at it: these guys bake what is easily the best bread in Birmingham, bar absolutely no-one. Properly made, hand-shaped crusty sourdough, part-rye loaves like the ‘Maslin’ and dark, treacly all-rye tin varieties. Great big bloomin’ bloomers, multi-grain loaves and specialty breads like focaccias and brioche. You might also find a sticky bun or two if they haven’t sold out. It’s not just bread, there is a (most) weekly Friday lunch club called Stirchley Brewhouse, with a rotating menu of sandwiches and hot food, usually one meat and one vegetarian option, with Sarah Frost’s amazing cakes to have afters. There are occasional pop-ups, including the highly-rated CANeat event which a no-choice set menu of progressive and innovative food (5* review from Paul Fulford). 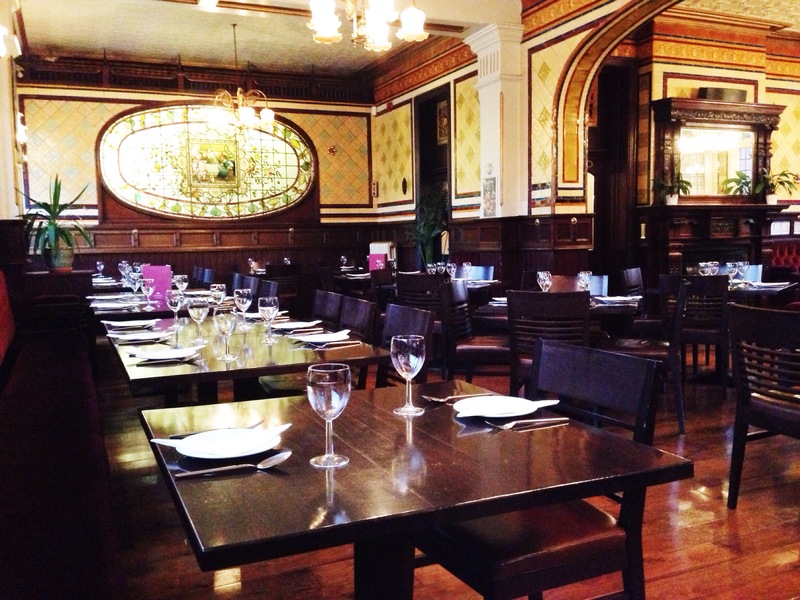 There is also the cookery school which hosts a variety of interesting events. I have been on the Simply sourdough course which I can highly recommend, there are other bread-making courses, foraging, clay oven building, fish and seafood (run by blog co-writer Lap), pickling and preserves, and many more! The opening hours are informed by the baking schedule, so it is open 2pm-7pm Tuesday-Friday and then they do an overnight bake on Friday so open 8.15am-2pm on Saturday. But not Sunday or Monday. 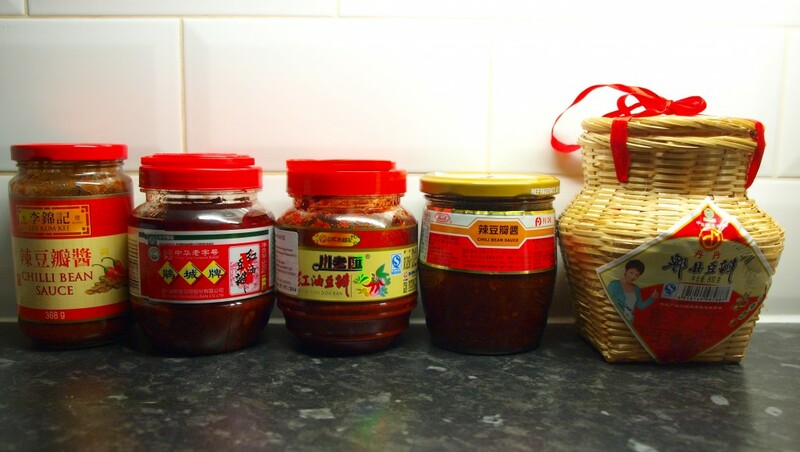 Reorganising my jar and bottle cupboard in the kitchen, you know the one with all the different vinegars (3 types of balsamic, white/red/rice wine, cider, strawberry), I found that I’d accumulated 5 different brands of chilli bean pastes. I don’t really know how this has come about but it’s a handy opportunity to do a taste test on them! 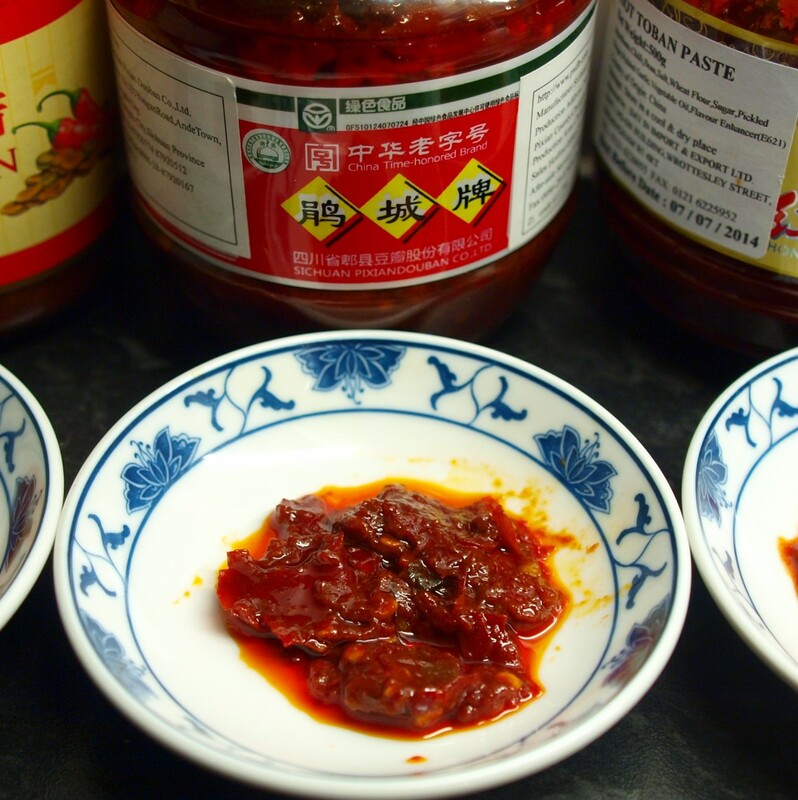 Chilli bean paste is a Chinese store cupboard essential. A mixture of chilli and bean (broad bean or soy bean) that’s been fermented together to give a deep complex umami flavour. It’s used in stir-fries, braises, hot-pots or anytime you want that addictive chilli hit. 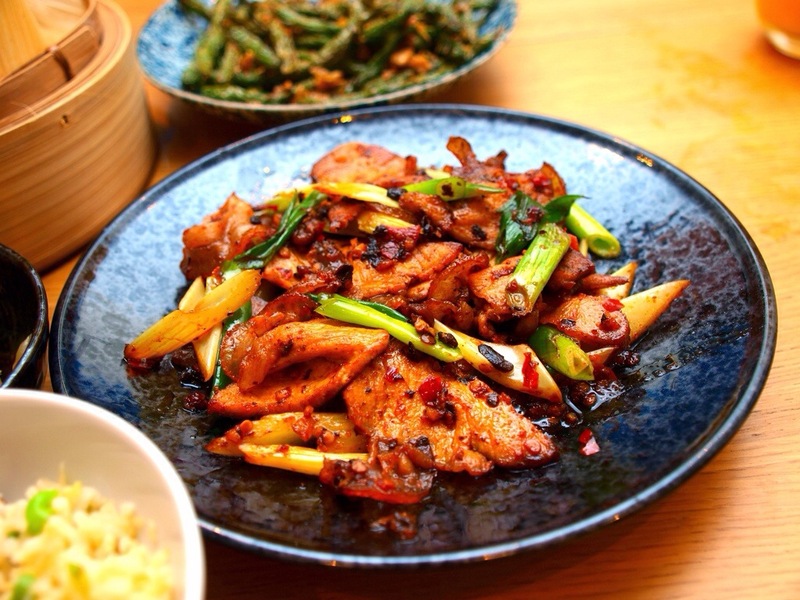 Particularly in Sichuan cookery where the chilli bean paste produced in Pixian county, Chengdu is considered the best. 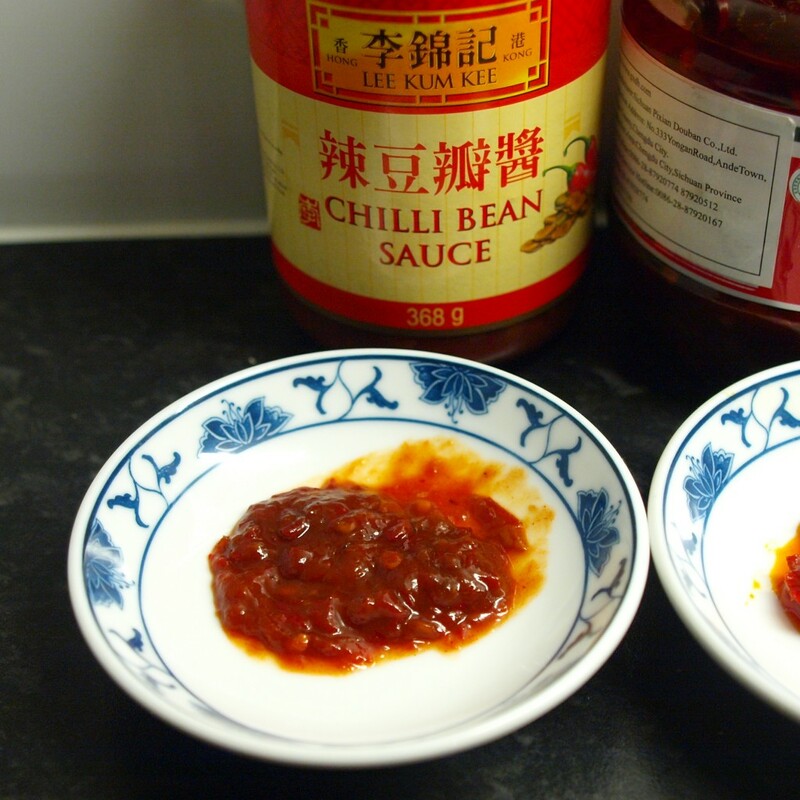 I’m not a Sichuanese expert so can’t comment on authenticity but I’m comparing them to chilli bean pastes from other parts of China so each of them is assessed on taste alone. 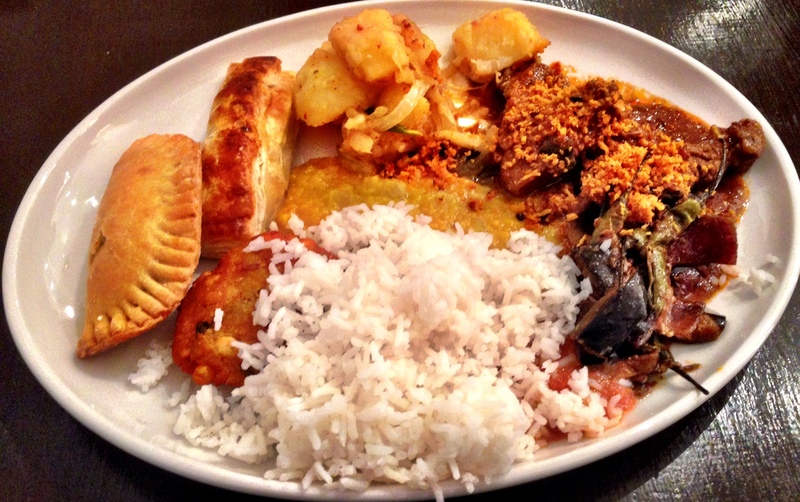 This is the one most people who cook Chinese food at home will have. LKK are a Hong Kong brand so is the most established in Chinese supermarkets here in the UK and in Western shops. Unusually it’s the hottest of the lot with a sweet garlicky flavour that doesn’t linger long. 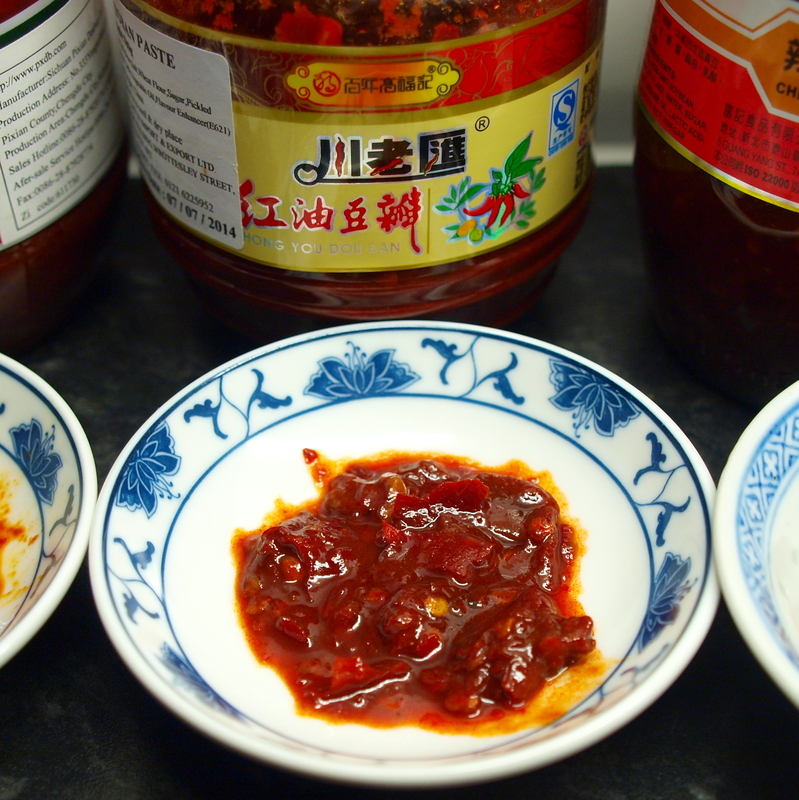 It doesn’t really have that fermented lactic flavour so it’s not really suitable for Sichuan dishes. The pale colour gives the game away a bit. I can’t imagine big vats of this having been fermented in the open for years at a time. 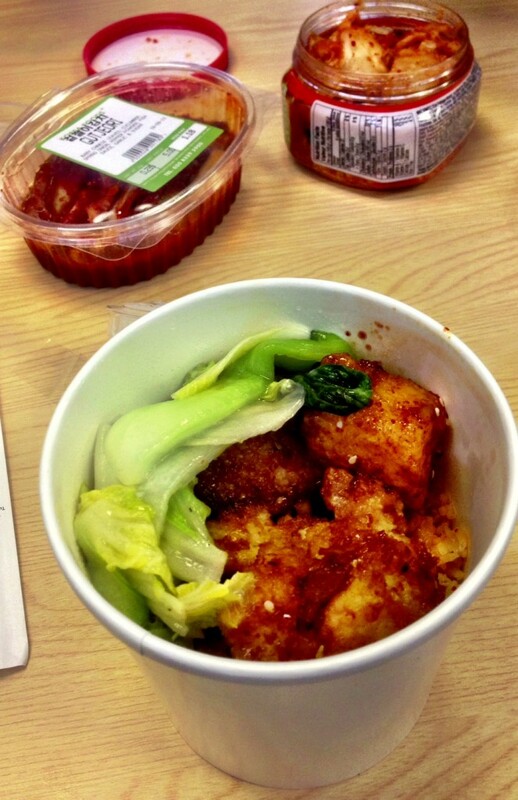 A bit one dimensional, however it is good in stir fried prawns. This plastic jar has a handy carry handle but unhandily if you don’t read any Chinese then it might be difficult to spot that it’s a Pixian style chilli bean paste. Ok there’s a clue in the company name in small print Sichuan Pixiandouban Co Ltd otherwise the jar I have has no other indication in English, not even ingredients. Which I’m sure is pretty illegal in this country. The importers need to sort this out. However I’m glad they’ve smuggled it in because the taste of this red oil 红油 version is fantastic. 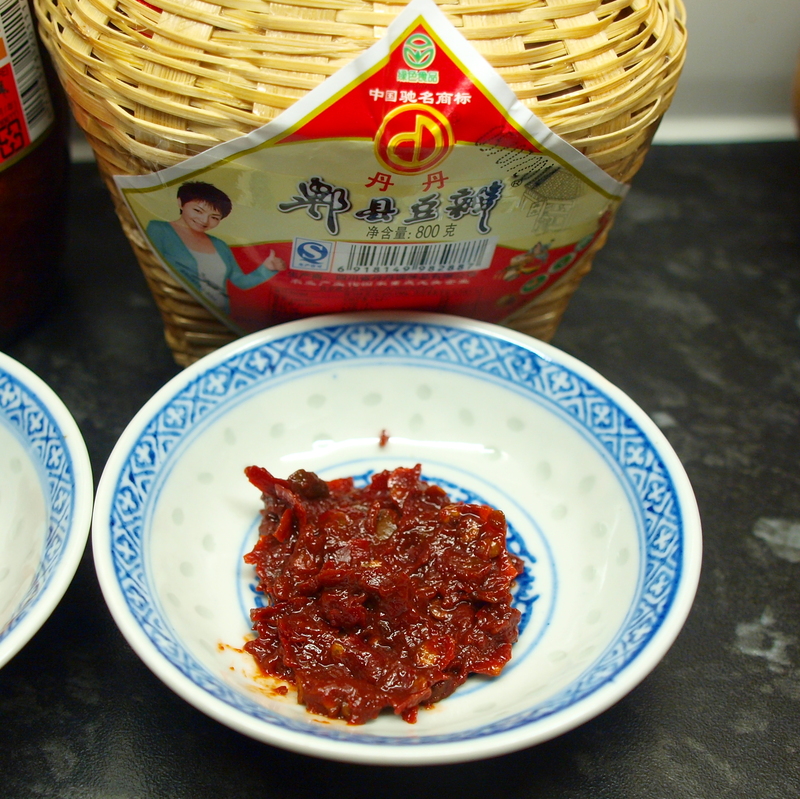 Rich red colour, well balanced flavour, mild to medium chilli, not too salty, perfect for twice cooked pork, the oily richness is lip-smacking. Comes in the same plastic jar with carry handle as the Juan City Brand. I wonder who is copying who? At least this jar has some English stuck on it from the importers Day In. 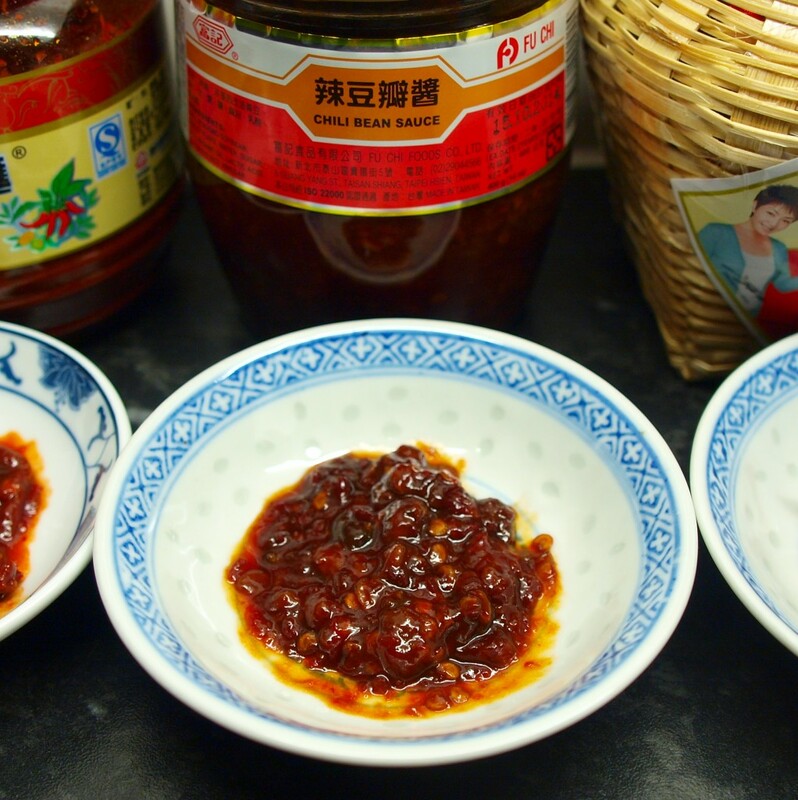 This is also a red oil version of Pixian style chilli bean paste with extras. It has the same deep lip-smacking flavour but, probably due to the pickled ginger and garlic, is really too salty to use in the same quantities as the Juan City Brand. But the less you use the less umami impact you get in your food. I struggled cooking with this until I started using it as a base for hot-pot flavouring lots of chicken stock. Taiwanese brand, the only one not to have any broad beans in but not lacking in deep rich flavour. The mildest of the lot, least salty, sweet round flavour so great to use in larger quantities. My favourite for fish-fragrant aubergines. The purest Pixian chilli bean paste here and it comes in the most darling wicker basket! First saw this on Fuchsia Dunlop’s blog but could never find it anywhere so when I spotted it recently on http://www.souschef.co.uk/ I snapped it up. There are two plastic sachets of the chunky paste in the basket that you have to decant elsewhere. This is not a red oil version like the other two Pixian pastes, it’s quite dry, slightly saltier than Juan City Brand. Even used sparingly it gives a great hit of flavour. I definitely wouldn’t waste this in a hot-pot! Great in braises.